Remember how we said in the first announcement that 3D ProAnimator 8 is all about speed and beauty? Well it's time to announce two more big new features. These two are all about beauty, but done in a way that's really fast. In case you haven't heard yet, we're releasing version 8 next week. If you didn't see the first two sneak peeks you missed the announcement of four big new features that will significantly change how you create 3D motion graphics. You'll be able to make unbelievably realistic pictures at incredible speeds. Features that are extremely flexible and will save your project's budget when it's time to make changes. At the end of this email find links to the first two announcements and discover just how special the Reactor Rendering System is. During this next week we'll continue to sell v7, but you'll get v8 for free once it ships. 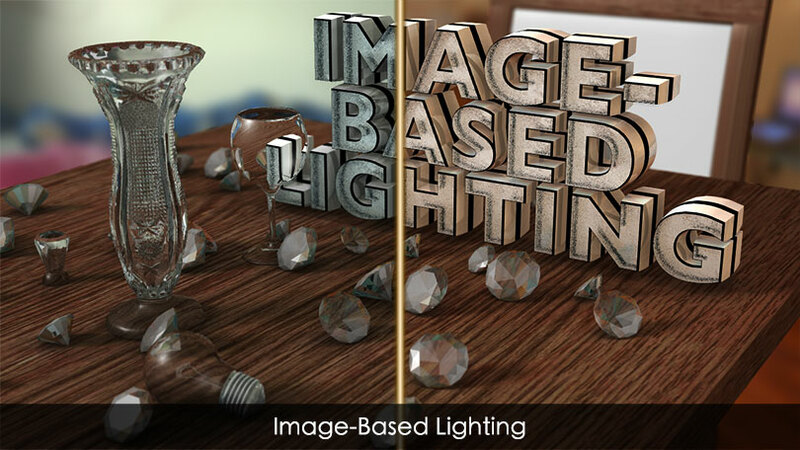 Image-Based Lighting, or IBL for short, is a way of lighting your entire scene by using nothing but a picture! You read that right. All you need to do to get completely realistic lighting is to choose a picture of the environment and 3D ProAnimator 8 takes care of the rest for you! There's no need to be a lighting expert or even take your own pictures. It's a really easy way of getting an epic look. And it's really really fast. Ambient occlusion darkens the places that don't receive much light. The sixth big new feature in 3D ProAnimator 8 could be called the reality feature. The formal name is Ambient Occlusion but you can think of it as corner darkening. This feature darkens the corners and crevices of 3D objects in a way that gives the effect of bounce lighting but without the enormous rendering hit. It makes your objects look much more realistic, and thankfully we figured out how to add Ambient Occlusion in production at real-time speeds. There is no more excuse for your work to not look incredibly realistic. Watch the demonstration video to see ambient occlusion in action. So there you go. Big New Features #5 and #6. We said in the last sneak peek that Big New Features #1 through 4 would make getting 3D ProAnimator v8 a no-brainer. But with the addition of Ambient Occlusion and Image-Based Lighting this new version becomes a tremendous value. Remember too, all of this 3D happiness works directly inside of After Effects so there's no wasted time round-tripping to external programs. Of course, if After Effects isn't your cup of tea, then you can use the standalone version of 3D ProAnimator to create your motion graphics, then go directly to edit. Be sure to check your email for the next sneak peek and spread the word! The next big new features will be revealed in just a few days! If you missed the first two sneak peeks, then you missed a lot! Learn about the Reactor Rendering System, Camera Focus, Instancing and Object Distribution here.